Bus Lane Assembly: We all gain from enforcing the rules. The material in this post is the basis of an assembly I’ve given before about the need for enforcing rules. I’m about to use this particular preach again as we continue to push forward on our drive for impeccable behaviour. It’s been an intense few weeks as students learn where the boundaries lie, with literally hundreds of students in detentions every day. But the numbers are dropping and, so far, it’s working really well. In fact, the improvement has been dramatic. Early on in my life as a commuter between London and Chelmsford, I had to learn the boundaries of the journey. It was painful. I’m ashamed to admit that within a few months I’d been given three speeding tickets. They came in quick succession from the notorious speed camera at the end of the M11 where the speed limit drops from 70 to 50 mph. There are no pavements or pedestrians; it just feels like the same road – but as most people are going at 80 mph, they make you slow…right…down as the motorway ends. Travelling home late at night, I messed this up three times in a matter of months, tired after work and not taking enough notice. I was fined for each offence. On the last occasion my failure to attend the court hearing (which I thought was optional) was interpreted as contempt – and I was fined £670! That hurt. In addition, I have been driving around with 10 points on my license for the last 5 years. Wow – what an effect that has had. The enforcement worked. With suspension only one violation away, it forced me to change my behaviour in a fundamental way. I’ve been the very most diligent driver imaginable ever since. 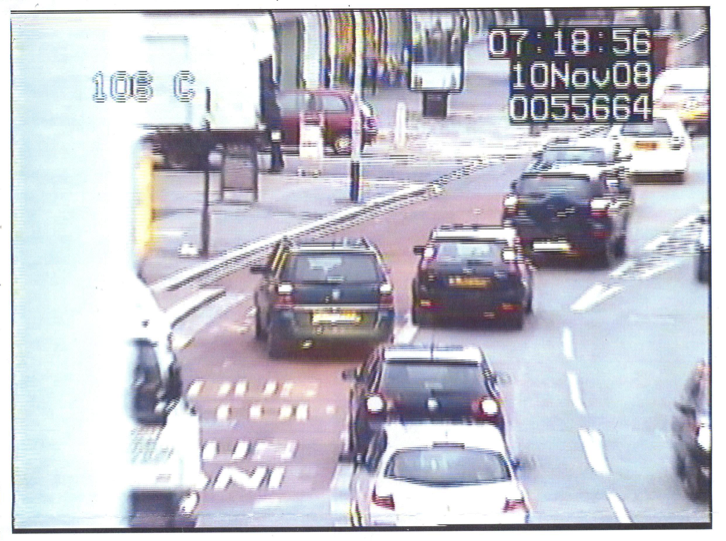 As you can see, a big white truck is pulling into the lane behind me, right across the path of any bus. I turned into the bus lane because I thought that, since no buses would actually be able to use it, blocked by the truck, it was perfectly sensible for me to use it. I told myself that I wasn’t doing anything wrong (lucky me for spotting the opportunity), that it was only for a few seconds and – truth be told – I didn’t think anyone would notice. I appealed. I lost. 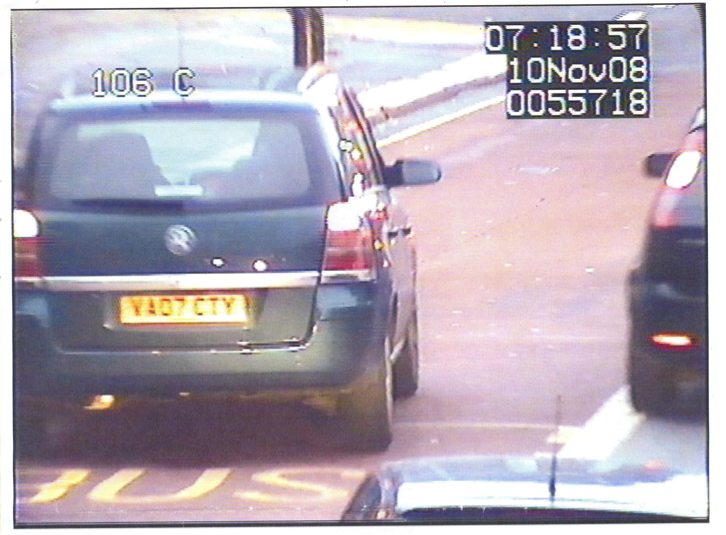 The fine stood and ever since then I have never ever driven into a bus lane. Now I see those Bus Lane Enforcement Camera signs everywhere. Even though I felt it was harsh, the enforcement worked. I’ve become a Bus Lane Saint. After a short period of raging, I realised that, of course, the camera operator was just doing his job. Buses matter; people rely on them and if we’re serious about reducing traffic congestion and emissions, then people need confidence that the buses really work. Bus Lanes are a great idea and it must be a huge drain on resources for the enforcement team to have to assess every single situation in minute detail. I also reflected that, in truth, the camera operator who logged my violation was working for me and the community I live in – keeping the buses running. I once heard it put that “integrity means doing the right thing when nobody is looking”. I’d been trying to cheat a little, hoping no-one would notice. When I thought about it, all my raging and outrage was my way of deflecting from the fact that I knew I’d done the wrong thing. I was annoyed because I got caught doing something other people seem to do all the time. Of course, that’s no excuse. If one person is on a double yellow line, it doesn’t make it OK for others to join them; it makes it worse. Rightly or wrongly, there is something in human nature that leads people to seek advantage for themselves; to cut corners and bend the rules – whilst expecting that the rules are there when they need them. We’re individuals as well as social animals – it’s complicated. As a community, we are stronger when we support each other to stick to our rules; it’s more fair for everyone and we get a better outcome. Safer roads and better bus services are great successes of enforcement of rules that most of us happily sign up to. The fact is that, without the enforcement, even rules that we all agree on would soon fall apart. The enforcement is part of the process of a community working out the rules that we agree to live by. We can’t look for exemptions and excuses without putting pressure on the system – with negative consequences for everyone, especially if the excuses are weak. So, let’s embrace that. The rules are there for all of us; the people who enforce them do an important job. It’s not about being unfairly controlled or being subjected to an unjust authoritarian power; it’s about making our community better for the maximum benefit to everyone in it. A great school community functions best when the rules are clear and the enforcement is consistent and relentless: we all have our part to play in that. Take it from me, if you make a deliberate choice to break the rules or act thoughtlessly – it’s a lot healthier to take a good look at yourself before you get angry with the system. 2. I don’t always concentrate when I’m driving, so my speed creeps up/I pass a camera and don’t ‘tune in’ until it’s too late. The course really made me think about this, and also brought home very powerfully the possible consequences of not obeying traffic rules/laws. I have transformed my practice as a result…. Glad to know i’m not alone. I always like the statistic that 80% of drivers think they are above average. I got a parking ticket last weekend. Scarily, my second thought (after annoyance) was: I’ll do an assembly about this, like Tom Sherrington’s. It worked very well. Thanks for posting these ideas. Thanks Lewis. Might as well get something positive from it.